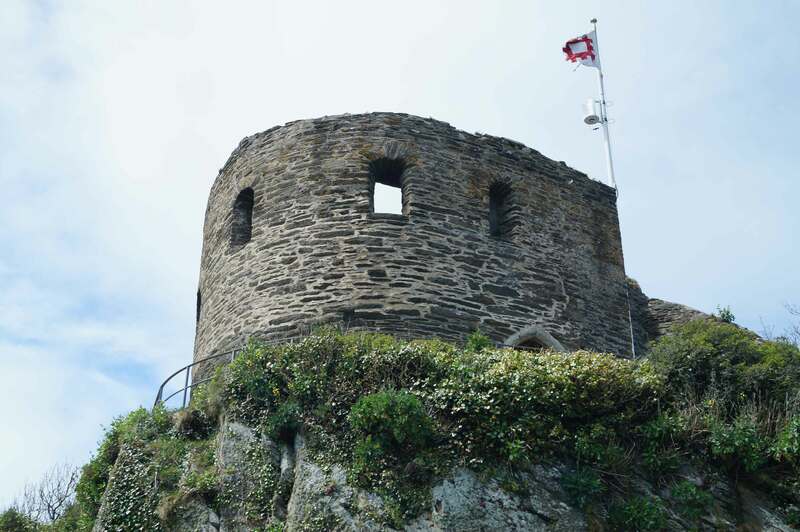 St Catherine's Castle was an artillery blockhouse designed to protect the prosperous port of Fowey and was one of the first fortifications constructed as a result of Henry VIII’s break with the Roman Catholic church. It saw no action during his reign but later helped deny the port to the Parliamentarians during the Civil War and repulsed a Dutch fleet in 1667. Fowey was established when Tywardreath Priory granted a charter formally recognising the town in 1300. The town grew into a thriving port made rich from privateering activities during the Hundred Years War. Inevitably such practises made it a target for attack and in the late fourteenth century defences were built consisting of a pair of artillery blockhouses positioned on either side of the channel into the port. A successful French attack in 1457 led to augmentation by a defensive boom - a thick chain that blocked access to enemy ships but which was dropped to the seabed for allied vessels - and these arrangements proved adequate until the sixteenth century. In 1534 Henry VIII had sealed the Act of Supremacy which made the King, rather than the Pope, "supreme head" of the English church. This coincided with an alliance between France and the Holy Roman Emperor making the possibility of a French or Spanish invasion a distinct possibility. Commissioners acting for the King reviewed coastal defence across Southern England and found the defences at Fowey to be insufficient. St Catherine's Castle was built to remedy the situation with work possibly starting as early as 1536 - a couple of years before the King's 1539 "device" (Act) which commenced the vast fort building programme concentrated along the South coast. The work on St Catherine's was supervised by Thomas Treffry (1529-54), a prominent local, who also held the official office of collector of customs for Fowey and Plymouth. The funds generated from these activities were seemingly inadequate as he complained to Thomas Cromwell, Lord Chancellor that he was maintaining the defences of Fowey largely at his own expense. He bid to be relieved of his Royal duties and transferred to the captaincy of St Mawes Castle - a requested granted in 1541. 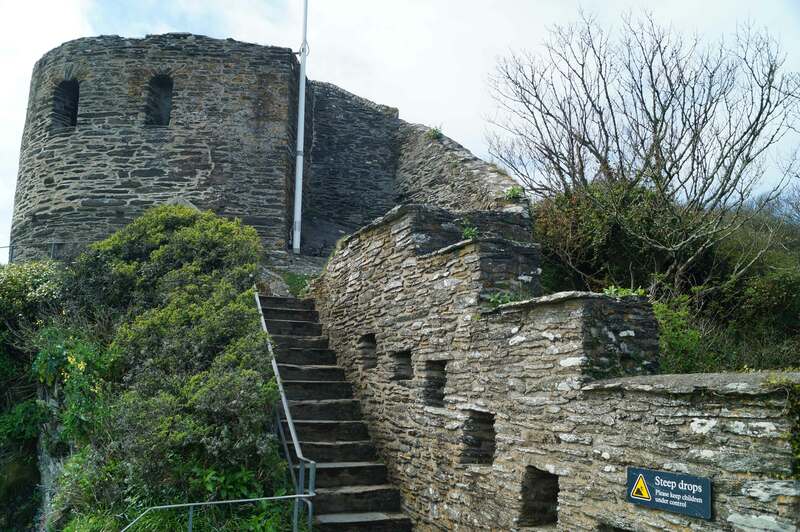 St Catherine’s Castle itself was little more than a blockhouse – smaller than the (slightly earlier) Bayard’s Cove Fort but comparable to Little Dennis (perhaps also built by Treffry) at Pendennis Castle. It consisted of a D-shaped, two storey tower. The ground floor had three gunports covering both the approach and the harbour itself. The upper storey was connected via a spiral staircase and had two gunports plus other openings for small arms. There were no residential quarters with the garrison probably either billeted in Fowey itself or actually drawn from the sailors who lived/worked there. A wall, punctuated with slots for firing small arms and a single gateway, was constructed to the immediate rear of the castle. The invasion fears of Henry's reign passed without incident but St Catherine's continued to be kept in good repair. During the Civil War it was held by Royalist forces and was instrumental in ensuring an attempted naval evacuation from Fowey by Parliamentary forces after their defeat at the Battle of Lostwithiel (1644) failed. Furthermore, in conjunction with the fourteenth century blockhouses, it repelled an attempted Dutch attack in 1667. The fort was neglected later in the seventeenth century and a report of 1684 describes it as "ruinous". No further modifications were made until 1855 when, prompted by concerns over the re-armament policies of Napoleon III, a new battery was built on the site. A flat platform was carved out of the cliff immediately below the Tudor castle for two gun positions. They were protected by a low parapet wall whilst a magazine was buried in the rock. The site was abandoned by the late nineteenth century but, following the Dunkirk evacuation in June 1940 and the subsequent concerns over a German invasion, the site was reactivated. The Tudor castle itself became an observation post controlling a submarine minefield that had been laid across Fowey harbour. The 1855 battery was also brought back into use hosting a pair of anti-aircraft guns with an adjacent concrete pillbox added for a machine gun. A new battery was also built on the high ground above the old castle housing one 4.7inch anti-ship gun (in the approximate position of the modern sheltered seat). 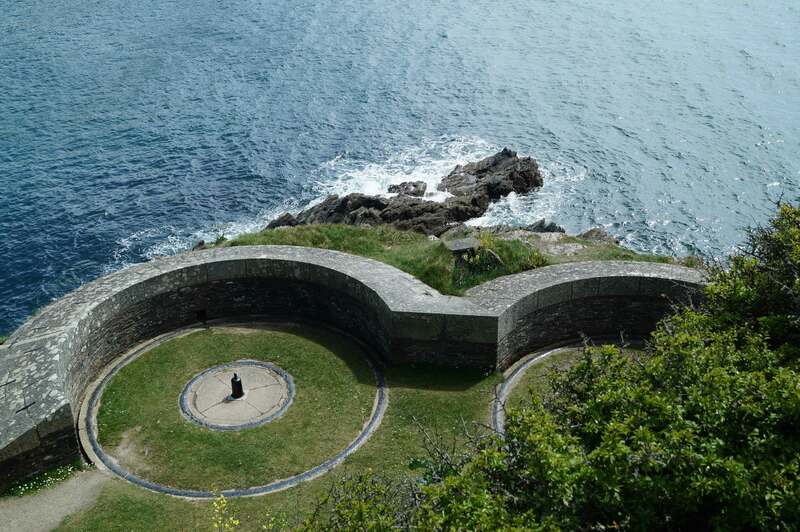 A second 4.7inch gun was installed within the 1855 battery whilst further defences were built on the headland on the other side of Fowey harbour. After the war the WWII defences were demolished and the castle abandoned once more. Harringtom, P (2007). The Castles of Henry VIII. Osprey, Oxford. Historic England (2016). Polruan Blockhouse. List Entry: 1019056. Swindon. Keast, J (1987). The Story of Fowey. Fowey. St Catherine’s Castle occupies a headland guarding the entrance to Fowey Harbour. A small blockhouse rather than a substantive castle, it nevertheless offers superb panoramic views of the harbour. Curtain Wall. A small curtain wall separated the castle and battery from the land approaches. 1855 Gun Battery. The 1855 battery was built following concerns over French re-armament. It was modified to take new guns in 1940. Fowey Harbour. Note Polruan blockhouse (centre) and its pair would have been directly opposite. A WWII gun battery was built on the headland on the extreme right of the picture. St Catherine's Castle is accessed from the South West Coastal Path. Parking is available in several locations in Fowey just a short walk away from the castle. You can also get the ferry across to Polruan to see the blockhouse.